The Kenya Lake System in the Great Rift Valley consists of three lakes in basins on the floor of the valley, known for their high concentration of lesser flamingo, great white pelicans and migratory birds. All the three lakes are shallow, alkaline and are hydro-geologically connected through sub surface seepage of water. The alkalinity of the three lakes supports the abundant growth of the green algae (spirulina platensis) which is the food of the lesser flamingoes which congregate in the lakes in great numbers. Across the years we have visited each of the 3 inscribed lakes. The photo is of Lake Bogoria and our visit there in 1991 is the one we remember best – for the flamingos of course, but also for the active and regular geysers and volcanic fumaroles and, finally the road to get there!! We had rented a 4x4 and were rough camping. The so-called “road2 we took into the lake from the south (we wanted the more remote southern camp site) was VERY boulder strewn with sharp volcanic rocks and we acquired punctures in 2 different tyres at the same time. Unfortunately we only had 1 spare wheel and no air pump! Ah well, all part of the “adventure”! Unless they have improved the road we recommend taking the northern entrance. Flamingos move around and cannot be guaranteed in large numbers at all sites but we were pleased with the numbers when we were there – if you can only visit one lake try to find out before hand which lakes have flamingoes at that time. From what we saw, Bogoria didn’t really offer much else in the way of wildlife viewing beyond birds – Nakuru on the other hand is presented as more of general “Wildlife park” with a wide range of mammals including Lion, Rhino and Leopard. I remember it as a bit “zoo-like” compared with e.g the Mara and Samburu as it is situated just down the road from the busy town of Nakuru (pop 300k). In 2008 we visited the rift valley alkaline lakes of Ethiopia (see my review of Abijatta-Shalla http://www.worldheritagesite.org/sites/t0112.html ). Ethiopia’s late 20th century history resulted in significant and possibly irreversible damage to those lakes which it had tried unsuccessfully to inscribe as early as 1981. It is good that Kenya has “done the necessary” to preserve its own. 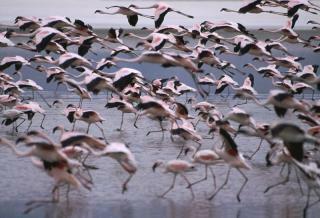 A visit to see the massed Flamingos at one or other of these lakes is worth fitting in if you can whilst in Kenya. Critically endangered fauna species: Black Rhinoceros - "Population size collapsed during the last century, from an estimated 65,000 animals in 1970 to a mere 2,300 in the 1990s. Rhino numbers are now increasing, but recovery is slow"